The arrival of April and the spring season calls for the great outdoors! Spend your weekend soaking in the sunshine and good vibes at one of these local events. Truly a fusion of style, taste, authenticity and entertainment, Sarafornia: ENGAGE Calistoga is a celebration unlike any other in the Napa Valley. Known for its bohemian vibe and genuine charm, Calistoga is the perfect place to make exploring and experiencing art approachable and fun. As the official kick off event for Arts in April, from April 4-7, connoisseurs of all tastes are invited to indulge their senses and ENGAGE their minds during this free, 4-day community event. Welcome the weekend with fabulous food truck fare, cocktail specials and live music on the Village Lawn at Vista Collina Resort. The Village Truck rolls up to the pop-up bar each Friday from 4PM - 6PM offering Chef Vincent Lesage’s signature bites such as Fried Chicken + Waffles, Brisket Nachos and Kimchi Tacos. While you're there, stop by the Foley Food & Wine Society Tasting Room and grab a glass of your favorite Foley Family wine! Adults at Play is back! Join Roth Estate as they kick off their popular event series this Friday. 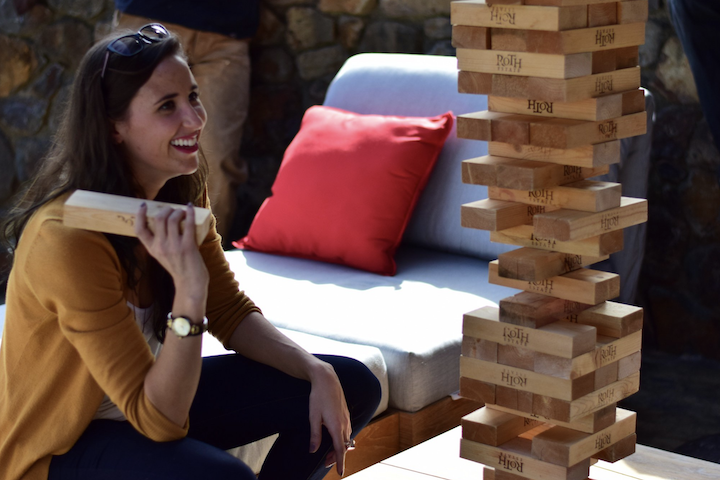 We can't think of a better way to start a weekend than with tasty bites, delicious Roth wines, great tunes from Spike's Awesome Hotcakes, and fun outdoor games. The event is complimentary to attend and is one you won't want to miss. April marks the time of year that Bodega Bay locals say their little town turns into "Blowdega Bay" - and hence, the perfect time for Sonoma Coast Kite Month! Bring your kids or rekindle with your inner child and take advantage of a month of kite activities, specials, and the opportunity to play with fellow kite enthusiasts. Don't have a kite? No worries - there are two local stores almost completely dedicated to kites. Stop by the Sonoma Coast Visitor Center to pick up your brochure with kite specials and event a special Instagram challenge! Battle of the Brews celebrates all things craft beer at the biggest beer event Sonoma County has ever seen! With over 100 beer and food vendors, the event includes Craft Cup - Sonoma County's largest craft brew competition - along with live music, dancing, and more. Lincourt wants to show their appreciation to their guests by hosting an afternoon at the vineyard! Enjoy a delightful spring day in Solvang with live music, Lincourt wines, and springtime-themed small bites. They'll have barrels to taste, lawn games to play, prizes to win, and lots of Lincourt love to show! Tickets are $15 for Lincourt wine club members and their guests; $25 for general admission.